If you’re considering IVF, if you are a twin or have a twin, or are married to a twin, or dating one, this book is a necessity. "Considering IVF"? Really? To be fair, the chapter on fertility treatments is more relevant to fraternal twins. But if IVF is your only interest, you can probably just read that chapter. My parents could not have been more loving, stimulating, or "modern" in their childrearing, but it literally never occurred to them to spend time with Robin and me separately and that omission backfired at the end of the day. When I interviewed my mother for my book, and asked her why she and Dad never took us anywhere separately, she looked pained. "Because we didn’t think that way," she told me. "We just thought in terms of doing things as a family. I should have been aware of it because I should have been smart enough to figure out that something is gained when you’re alone with a person. I should have realized that. But it never occurred to us. It always was a matter of 'Let’s. Not: 'You come with me and you go with him.'" She said they realized their mistake in one powerful instant when I was eighteen and they invited me to go with them for a weekend at a bed-and-breakfast. "You said you were uncomfortable coming along because you’d never been alone with us. It was like somebody shot us between the eyes; we couldn’t believe it. ‘How could this have happened?’ We never noticed that we had never been with one child." Reading this made me realize that having twins presents a unique set of challenges, and intrigued me enough to borrow the book from the library. My favorite parts were the opening chapter about the Twins Festival in Twinsburg, Ohio, the interviews with Tiki and Ronde Barber, and the author's recollections growing up as a twin. The Twinsburg chapter reads like a fun, goofy travelogue exploring the twee-er aspects of twinning. I don't expect we'll ever go, but it's a good reminder of what cultural niches exist for twins and their parents. 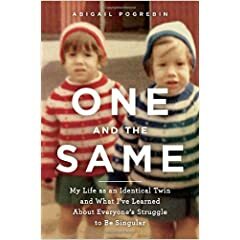 The personal accounts of growing up a twin were interesting to read, and helped me see things from the perspective of the twin child rather than the parent, unlike most of the other books I've read which focus on the parent's point of view. The parts I didn't need to read (and skipped) were about twins in 9/11 or the Holocaust. While these sections are undoubtedly revealing for twins trying to understand their own identity or the role of twins in society, they are not something a future parent of twins wants to read. Twinometer: 7/10. I would have liked to rate it higher, but the parts I had to scan and skip dragged it down. Here's something you may not have considered. As a parent of twin babies, if you and your spouse want to fly somewhere with them as lap infants, you will not be allowed to sit with your spouse. At first this makes no sense, but the problem is that each set of seats on an aircraft only has one extra oxygen mask, and your bundles of joy require two. This came up in a discussion yesterday with a colleague who was already trying to juggle a combined work/pleasure trip with all the attendant seating and booking issues. He didn't need this added headache, but as a parent of twins, he's getting used to it. The supposition that most women pregnant with twins could -- or would -- wear this does in fact raise in me a slight panic. On the other hand, the sentiment really made me laugh... and laugh... and laugh. The tee version is available on the CafePress site. A tricky social situation I’d never thought of: what do you do when your identical twin dies? Well, you bury and mourn him or her, of course, and then go through their stuff. (You know it will fit you!) But here’s what I’m getting at: when you show up at the funeral, many of the deceased’s friends, co-workers, etc. will never have met you. I’d guess that somewhere around a third of them might not even know he or she was a twin. In other words: there will be whispers, pointing, dropped drinks, maybe screams. You will be widely assumed to be the dead, come back to life. This guy gives me hope.